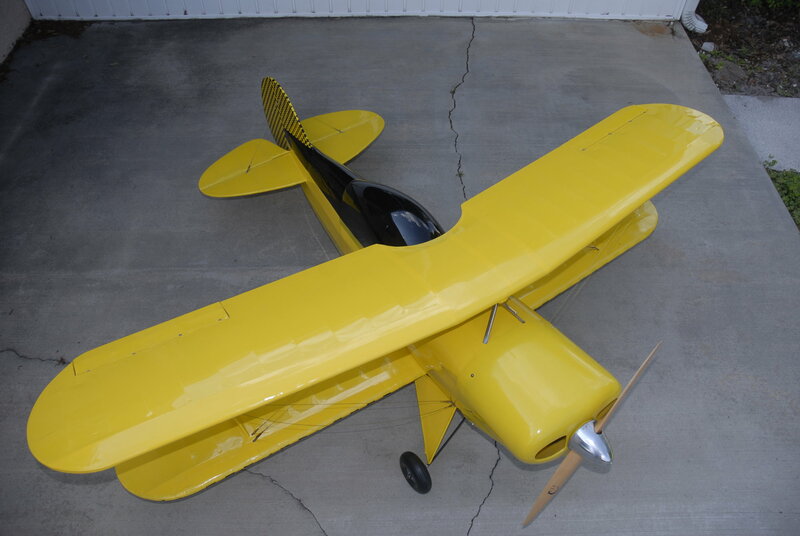 Iv'e got a chance to get a Bob Dively Pitts that is pretty much assembled as far as the airframe is concerned. The price is right and I'll have to get a cowling and stuff but, like I said, I think the price is right. I have a G62 engine that I could put in it but I was wondering what everyone else was using in this bird. I don't think that the plane would be overpowered but would it fly okay? I know that some put 80cc engines in this plane. I'll welcome any thoughts or input. Thanks in advance! RE: Bob Dively Pitts Project! This one is on my got to do list and I think the G-62 would have it a little underpowered.I think the new DA 85 or the DA 100 would make it fly more true to scale with the kind of vertical it needs to fly like the real bird.Good luck and post some pics. Don't count your chickens till they hatch. Shelby didn't call me back with the man's number that has the plane. Nah, not doin that. If it happens, great. Just trying to be sure that it's the right thing to do if it does come around. Well, it happened and now I've got an aging Bob Dively Pitts airframe. I'm going to contact Bob Dively Models to get the plans. 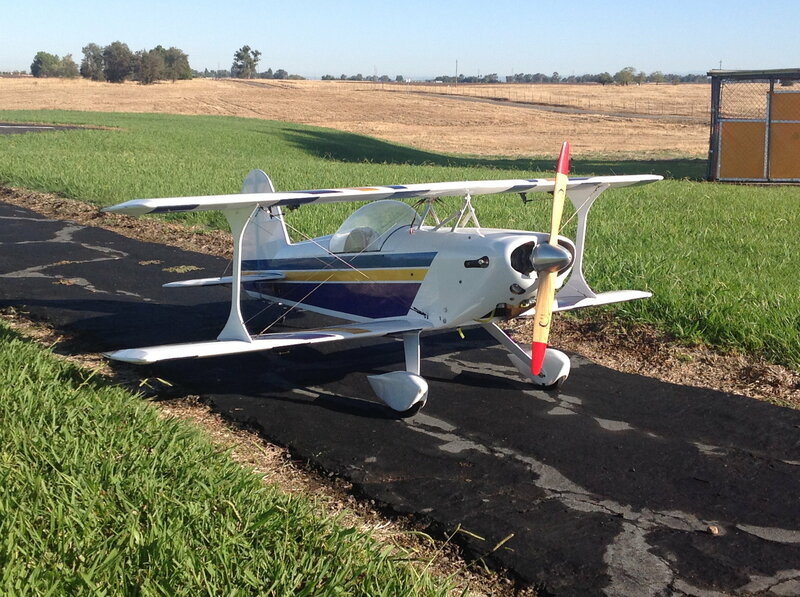 My dad is already building me a 60-inch wingspan Pitts and there is a lot that is similar to this one. I'll probably monocote it instead of the aluminum sheeting that BDM uses. HOpefully, we can make it a little lighter. Just wanted to update everyone as to where the project is currently. I know that this is an S2 but I was thinking of doing this plane more like the old Number One Pitts. Something a little different. Here's a few pics. Keep us posted with pics,looks like a lot of the work is done.Bill at Dively can give you a lot of input on how they fly and engine choices.I still think an 80-100cc is what you'll need to power it properly.Good luck and look forward to seeing the finished plane! I spoke to bill today and he suggested an 80cc or larger. I'll have to fess up to getting one sometime down the road. There's no sense in cutting corners on something like this. Anyone still interested in bipes? Seems these big birds are prone to siting on the back burners. I've read various threads of guys taking years, and in my case many years to get something ready to fly. My dad worked on the plane several times since 2007 when I got the plane. We'd get it out once in a while and rebuild the carb and fire it up, but never flew it. Biggest reason was that the small tube the holds the top wing on would constantly slide out of position. I used a length of threaded rod and double-nutted each side so now the tube doesn't go anywhere. Another reason was getting it to the field. These things are BIG!!!! I had a cover on my truck, but the plane was too big to fit under it. I've now got a truck cap, and there are no height issues now! I just went over everything and got the plane ready to go --- again. I'm waiting for a good day to head out to the field to fly it. Interesting story... The guy I bought the airframe from purchased it at a swap meet at another flying field. He was looking at it (the seller had $50 in marker on the firewall), and the seller asked, "What'll ya give me for it?" Well, Jerry says jokingly, "$30".... To which the seller said "Sold!" Jerry said he'd never fly it, never finish it and likely never do anything with it. So, when he heard that I was interested, he offered to sell it to me for what he had in it. Now that I fly at this field, I've learned who Jerry bought it from and I've talked to him about the plane. He was happy to hear that the "ol' girl" is still around! Hopefully, flying soon. I've done a bunch of research and found several versions that are flying with a G62, so that is what I put in it, since that's what I had. Sure, bigger is better, but we'll see how it flies with the Zenoah. Anyways, here's a couple of pix of the finished plane and hopefully, a flight report soon. That is, if anyone is still interested in an old bipe. Lol. Always nice to see a large older aerobatic bipe. 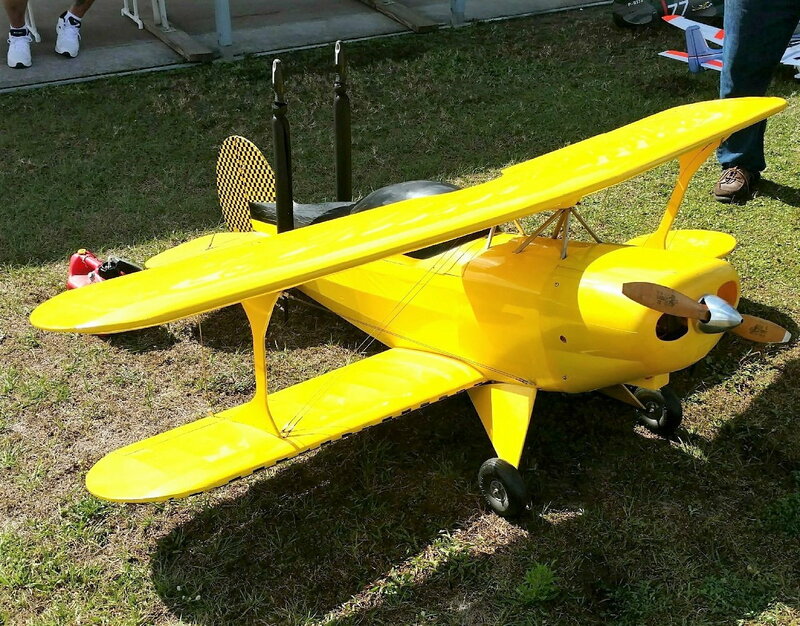 Pitts, Eagles, Skybolt and even my Reed Falcon always grabs my attention. Even more so when there is a cool story behind it like yours. Well, it's officially an airplane!!!! Had it out to the field on Saturday and after an extensive assembly and checking everything two, three times, it was time to maiden the "Big Pitts". The take-off was less than stellar, as the plane wasn't trimmed out and I didn't want to force it off the ground. Did that with my smaller Pitts and decided quickly not to try that again! Just as I was making the decision to go or no, it started to lift off. Once it was in the air, it only took a little bit of trim to get it to fly hands-off. Easily fly at 30-40% throttle with that G-62 and 22x6-10 Zinger. I don't fly 3D, and with the age of this air frame, I'll fly her like the lady she is, no rough and tumbling for this plane. I've got others I can toss around. I have a Lanier 50cc Yak that I've flown only a couple of times, so I'm still getting used to the larger, heavier air frames. The Pitts weighs in at 23lbs. During the flight, my thumbs were a little shaky, that's the first time in a long time that I've had that happen. The flight was short (5 min.) and after a couple of rounds of the field, I brought her in for a somewhat respectable landing. Couple of bounces, but it was under power, as I don't know how this airframe will slow down and I don't want to find out how slow is too slow. I'll likely feel better as I get more flights on the plane. So far as the engine, it pulls it around just fine for me. Seems to have a fair reserve of power to pull out, but of course, it's not 3D. I think for me, the G62 is a good choice, it's reliable, solid, and an excellent engine for a first-time gasser guy like myself. I've got a magneto, and I'm still working out the final tune and starting procedure, but it runs good and I don't have an ignition or ignition battery to worry about. I went through and fixed a few things like a guide wire that came loose and some little, personal things. But, it is officially now a plane! The plane did attract a LOT of attention at the field, especially when it landed. I guess it surprised them that it did. =) Anyways, one of the guys got this photo of it at the field. Doesn't look too bad for an old girl!